That statement is no less true today than it was back then. Since this book was first printed, a whole new class of paddlers has emerged, the “steep creekers.” These people paddle small creeks with limited drainages that flow perhaps a dozen times per year, taking hair-raising trips and challenging the heretofore limits of the Kentucky whitewater realm. Advances and variations in boat designs have gone far beyond what paddlers of the 1970s could have even imagined. Today we have modern canoes of varied plastic composites that range from heavily rockered whitewater boats to long and deep touring boats designed for extended trips. And kayaks have changed more. Today we have bombproof boats designed for maneuvering heavy whitewater and short, squat “play boats” used by paddlers to “surf” one single rapid for hours. 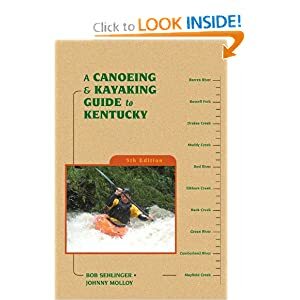 This book attempts to inform paddlers of paddling opportunities in the Bluegrass State, especially as the sport has advanced and many new streams are being explored. New watercourses have been added to this latest edition. This guidebook is the product of scouting miles of river, and hours of map work and research writing. Along the way, many memories were made. We hope you will make some memories of your own, paddling the streams of Kentucky.